Magic Camera 8.8 adds a powerful virtual camera to your system for video chat. You can use it as a real webcam and set pre-recorded video, photo albums, animations and desktop screens as its output. It support most webcam chat software or online chat website - MSN Messenger, Yahoo! Messenger, PalTalk, Skype, AIM, ICQ, Camfrog, ANYwebcam and many many others. 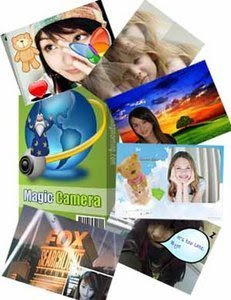 Magic Camera can add lots of funny photo frames, do text, image, animation, video overlays, support picture in picture functions and add amazing video effect to your real webcam and enable it to be used by several applications at the same time.